Jollof rice is very easy to hit or miss. 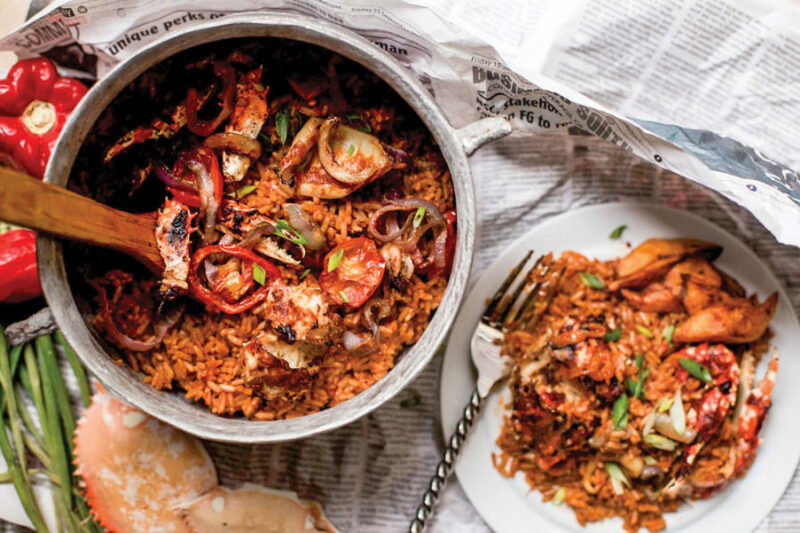 For this recipe, the spices and tomato/pepper mix should be adequate and the right amount of water and steam over low heat is what makes jollof rice what it is. Clean crabs and calamari and season lightly with some salt. Roast in the oven for about five to 10 minutes. Remove from oven and cool. Clean red onions, tatashe, bell peppers, tomatoes and ata rodo, then place on a clean oven tray and roast for about 15 minutes. In a clean pot, heat up the oil. Slice the red onion and add into hot oil, follow with curry powder, white pepper, thyme, tomato paste and cup of stock. Bring to boil. Add in blended tomato mix and seasoning cubes. Side Note: Add in seasoning cubes in bits, so that your rice isn’t over seasoned. Leave tomato mix to boil out and thicken a little bit. Take some out of the tomato mix for the seafood. Put your seafood back in the oven for about 15 minutes – this time, basting it with the cooked tomato sauce. Add in washed rice and some water, into the remaining tomato mix in the pot. Turn heat to low and let the rice steam. Open the pot after about 20 minutes to check that your rice is still hydrated. Add water in little bits in necessary or alternatively, you can use stock/broth. When rice is fully cooked, add in butter and steam for an additional two to three minutes, after which you can add in your seafood. Previous article Just tuning in to the NBA? Here’s a crash course on what you missed before Christmas.